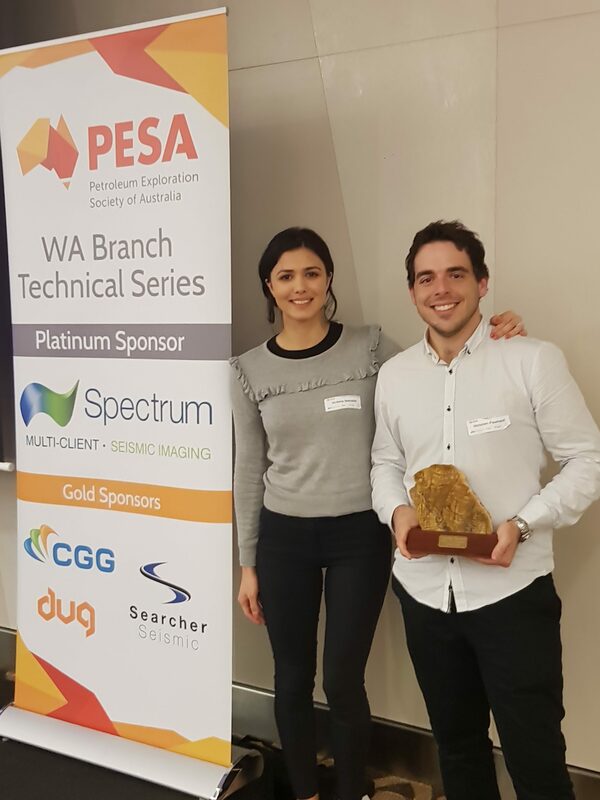 We are already halfway through 2018 and PESA WA Branch is still doing very well for the technical lunch series, with special gratitude to our four sponsors: Spectrum (Platinum), CGG (Gold), Searcher Seismic (Gold) and DUG (Gold). The branch announcements by Helen Debenham, WA Branch President, included the upcoming July technical talk by Larry Tilbury from Woodside on Pluto 4D’s outstanding success on Thursday 19th July. This will then be followed by our annual Winter Warmer social event at Ku De Ta on Friday 20th July – Keep an eye out for this event! Buru Energy have also kindly extended an invitation for a few spots to PESA members for their three-day internal course on Petrophysics by Martin Kennedy. This event will be held from 11th to 13th July at their office. Our June guest speaker, Victorien Paumard, was awarded the Woodside – PESA WA PhD Scholarship in December last year during the Christmas Luncheon. He has just completed his PhD at the Centre for Energy Geoscience, University of Western Australia, and he presented the results of his research to a large audience in the Argyle Room at Parmelia Hilton. His PhD research (co-founded by UWA and Chevron) was focused on the links between shelf-margin architecture, shallow-marine processes and deep-water depositional systems within the Barrow Group (Northern Carnarvon Basin, NWS, Australia). This research was made through the combination of state-of-the-art full-volume, semi-automated 3D seismic interpretation methods and quantitative analysis approaches, allowing a better characterization of the architecture of continental margins and a better prediction of the location of reservoirs along shelf-slope-basin profiles. These innovative 3D seismic interpretation techniques, referred to as Quantitative Seismic Stratigraphy (QSS), will be further developed through a new research consortium established at UWA, sponsored by several companies (BHP, ConocoPhillips, Oil Search, Quadrant Energy, Shell, TGS, Woodside). This project aims at investigating the linkages (quantified relationships) between shelf-margin architecture, hydrodynamic processes along deltaic shorelines and reservoir properties (type, volume, architecture) in deep water in a variety of basin settings. Ultimately, the objective of this study is to evaluate if quantitative measurement of shelf edge parameters on seismic data can become a useful exploration tool to predict shallow marine depositional style and deep-water play development. Victorien wishes to thank UWA and Chevron for giving him the opportunity to realize this PhD project. He is also very grateful to Geoscience Australia and TGS for providing the 3D seismic datasets used in this study. Eliis is also thanked for providing the PaleoScan software. Finally, Victorien would like to acknowledge Woodside as well and PESA for granting him the 2017 Woodside – PESA WA PhD Scholarship Award for his research. Again, we would like to thank our four sponsors of the WA Branch Technical Series, Spectrum (Platinum), CGG (Gold), Searcher Seismic (Gold) and DUG (Gold).